Raw frozen diets can be especially helpful for pets with allergies, digestive problems and young, active pets. These are high protein diets containing real meat and poultry, organ meats, vegetables, omega oils and assorted nutrients. Some are especially well-balanced diets. The freshness and high quality ingredients (e.g. hormone-free meats or organic vegetables) deliver exceptional results. The ingredients speak for themselves. 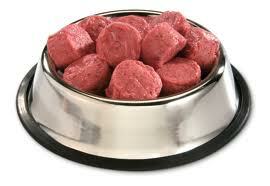 Many times, raw frozen diets are the best form of pet nutrition available. Raw frozen diets can be incorporated as a portion of your pet's diet. Pets don't have to eat an ALL-RAW diet. You can mix some raw into your pet's food with ease. There is a misnomer that pets can't mix raw with canned or dry. Pets can properly digest a mixture of foods and using even a small amount of raw provide valuable nutrition for your pet. Pets that eat raw frozen diets are getting a high moisture content which promotes overall health. The food is highly digestible so stool size is often substantially decreased when compared to dry food in particular. Pets eating dry food often have large stools because the food lacks nutrition and the ingredients are not absorbed by the pet. Raw frozen diets provide a superior form of pet nutrition because they are low in carbohydrates (carbohydrates can contribute to ear infections, allergies, UTIs, IBD, etc), easily digestible and full of fresh enzymes, vegetables, omega 3s and wholesome protein. Depending upon the health conditions and dietary preferences of your pet, raw food may not be an appropriate choice. Pets with elevated liver enzymes, pancreatitis or kidney disease can still have some raw food in their diet, but keep in mind that these diets are higher in fat and protein. Some very finicky pets may not like the taste. Many brands make companion products in raw freeze dried form (same ingredients but freeze dried) and that can be a great way to slowly introduce your pet to raw food. Raw food may not be convenient for your lifestyle. It cannot be left sitting out for very long. If your pet likes to graze, raw food needs to be given when you can supervise and pick up the bowl while still fresh. Raw frozen diets require "safe handling" for your protection and your pets' protection. Pet manufacturers clearly indicate safe handling guidelines on the package. When the safe handling guidelines are not followed, you and your pet could become ill. For example, leaving a bag of frozen raw food on the counter to defrost (should defrost in the refrigerator as you would any meat) can lead to pancreatitis and/or intestinal infections in your pet. The directions are easy to follow to avoid potential problems. In summary, raw food diets are an excellent form of pet nutrition for most pets. With patience and planning, most pet owners can incorporate some raw frozen commercially prepared food into their pet's nutrition regimen. Click here to read other articles about pet nutrition. **Homemade raw diets may be unbalanced, too high in fat and lacking in essential vitamins and nutrients. This commentary reviews commercially prepared pet food.